It’s finally here! The OS X Yosemite-ready version of CleanMyMac 2 has been released. Just launch CleanMyMac 2 and you’ll be prompted to update to the latest version (version 2.3). If for some reason the popup doesn’t launch, click CleanMyMac 2 in the menu bar and select Check for Updates. We hope you’re enjoying OS X Yosemite as much as we are here at MacPaw. Be sure to send us any feedback you have on the latest version of CleanMyMac 2, we’d greatly appreciate it. Thanks! We have released a beta version of CleanMyMac 2 with OS X Yosemite compatibility. Please note that official support for CleanMyMac 2 on OS X Yosemite will only be available when Apple officially launches OS X Yosemite to the public. If you do decide to download the latest beta version, we’d greatly appreciate your feedback. Thanks! 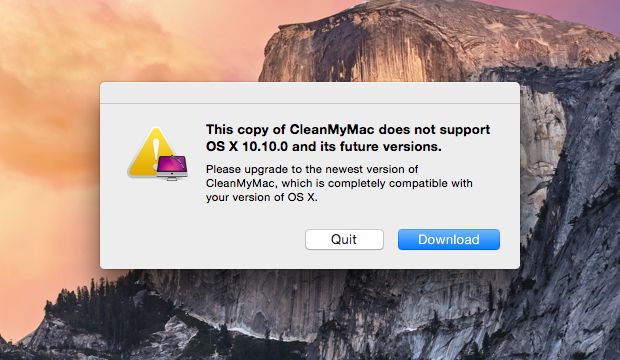 We’ve been getting a lot of tweets about why CleanMyMac 2 doesn’t work on OS X Yosemite. So, we figured we’d respond with a short blog post. First and foremost, for anyone who doesn’t know what OS X Yosemite is, it’s the newly released OS X for Mac. And by “newly released,” we actually mean “not released” — publicly, that is. OS X Yosemite is in beta right now. It’s only available to developers and members of the Apple OS X Beta Seed Program. Why is that? Well, when Apple goes to the WWDC and says, “Hey guys, we’ve got a brand new OS X and we want to demo it for you,” our developers’ ears perk up, because what they hear is, “Hey developers, check this out. Cool, right? Now get a copy of this and get cracking on making your software compatible with it.” In short, it was OS X Yosemite preview time for everyone — and a signal for developers to get to work! The problem is, the entire MacPaw dev team is still in San Francisco! They’re on a nice, well-earned vacation, and they’re sightseeing a bit before they come back to Kyiv to start fixing up CleanMyMac 2 for Yosemite. They worked hard during the last WWDC when OS X Mavericks came out, so this WWDC, it was time for them to relax a bit and enjoy it as Apple fans, and not Apple developers. But don’t worry, when they get back here this weekend, it’s nose to the grindstone — you’ll be cleaning up OS X Yosemite in no time. PS: Our testers have already begun testing their work, so the CleanMyMac 2 gears have already begun turning. PPS: MacPaw will not provide official support for OS X 10.10 Yosemite until it is officially released this fall. Updates will begin soon but use at your own risk!